Scattered showers will be possible both Saturday and Sunday afternoon, though Sunday will see more showers and a few storms. 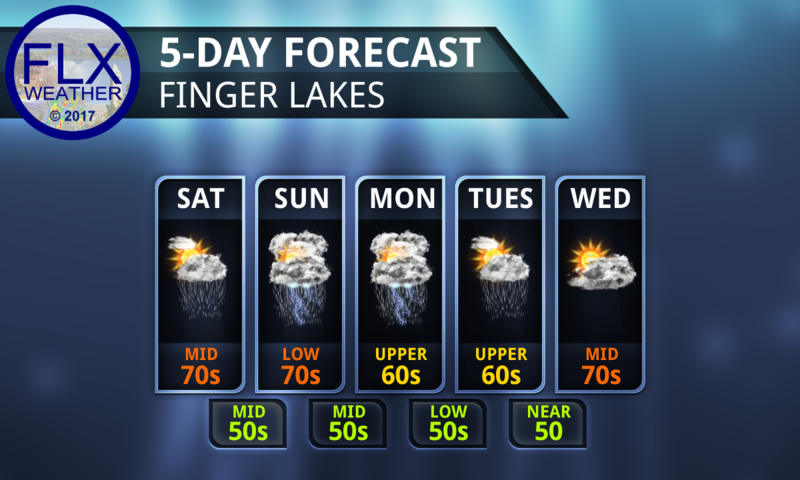 A cold front has moved through the Finger Lakes, taking the tropical humidity and replacing it with cooler and much drier air. Still, the weekend will not be completely precipitation free, especially on Sunday afternoon. As the cold air moves in aloft while the sun heats the ground during the morning hours, an inbalance will be created in the atmosphere. On Saturday, there will not be much of a trigger mechanism to take advantage of this inbalance. Also, with the cool air slow to seep in, the inbalance will not be as great as it will be on Sunday. Therefore, only a few isolated showers are expected to develop during the afternoon hours on Saturday. Many areas will likely remain dry. Temperatures will push into the mid 70s this afternoon before falling back into the 50s overnight with mostly clear skies. The chances for rain will be greater on Sunday as a small disturbance swings through. A few places may escape the rain all together, but scattered showers and a few thunderstorms are likely from the late morning through the afternoon hours. A little small, non-severe hail could fall from the storms. Temperatures Sunday will be cooler, with highs in the low 70s. Areas that see rain later in the evening will likely see fog develop as the sun sets and temperatures retreat back towards the 50s. Next week will start on a cool note, with highs Monday and Tuesday failing to reach 70 degrees for most areas. Again, scattered showers and thunderstorms will be possible during the afternoon hours. At this time, Monday looks a bit stormier and wetter than Tuesday, but the details in this sort of a pattern are usually uncertain until a day or two before hand. Wednesday should be dry as warmer air starts to work back into the region. High temperatures will still be a bit below normal, with afternoon temperatures in the mid 70s. Morning fog may continue to be likely throughout the week as low temperatures remain cool. While most of the immediate Finger Lakes will remain near or above 50 degrees, parts of the Southern Tier and Central New York could drop into the 40s, especially Wednesday morning. 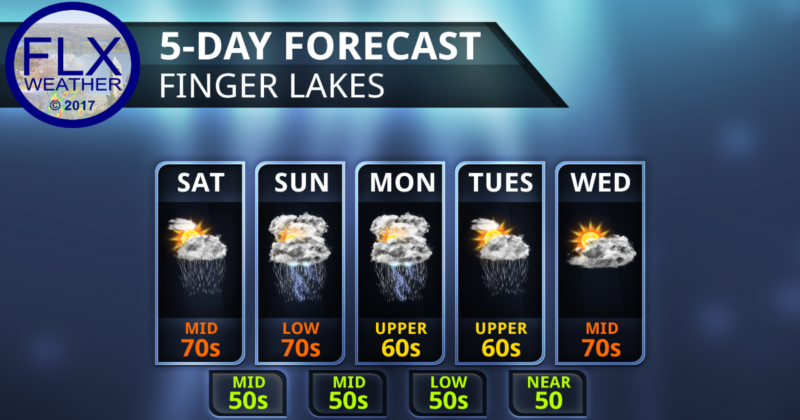 A new storm system may approach the region late in the week with showers and thunderstorms.